Easy Beach Party Ideas is sponsored by Banana Boat. All thoughts are my own. Living in South Texas, we live within driving distance of the beach and go a few times a year. But sometimes the kids want a taste of the beach and we really can’t make it happen! So we recently brought the beach to our house with these easy beach party ideas that are great for any summer get-together with friends! 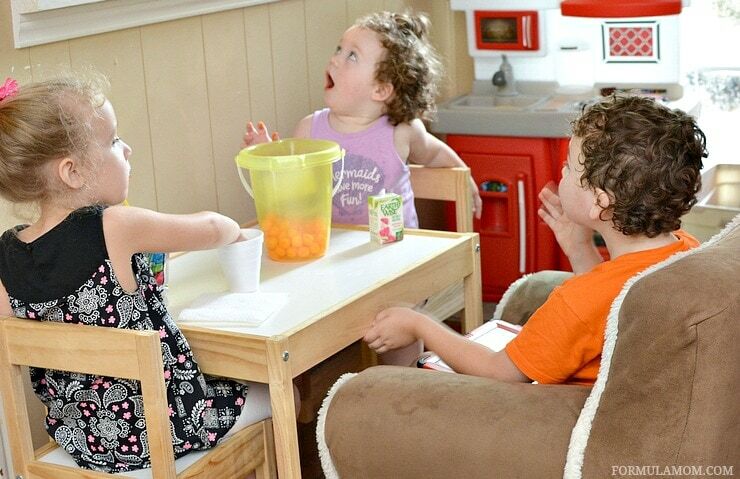 Check out how simple it is to have a fun beach bash! When it comes to easy party planning, I’ve learned that keeping it simple is the way to go. Once you decide on your theme then it’s all about coming up with some simple decorations and food ideas. It works well for any party theme! Get a few decorations that coordinate with the colors or theme. Then focus on the food. Parties and get-togethers are mostly about having plenty of food to eat with friends and family! So check out what we did for our recent beach bash with some friends we hadn’t seen in a while! 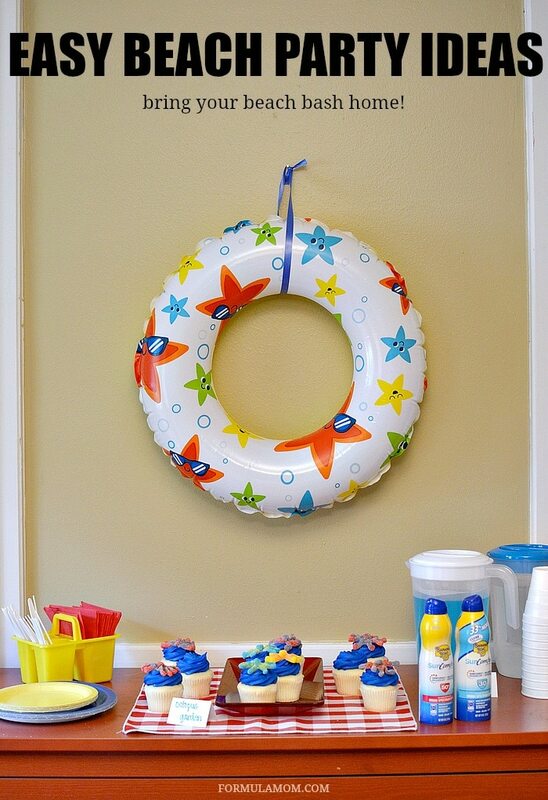 Finding things to decorate with is simple when it comes to a beach or pool theme. I was inspired by a beach ball the kids had been playing with around the house. 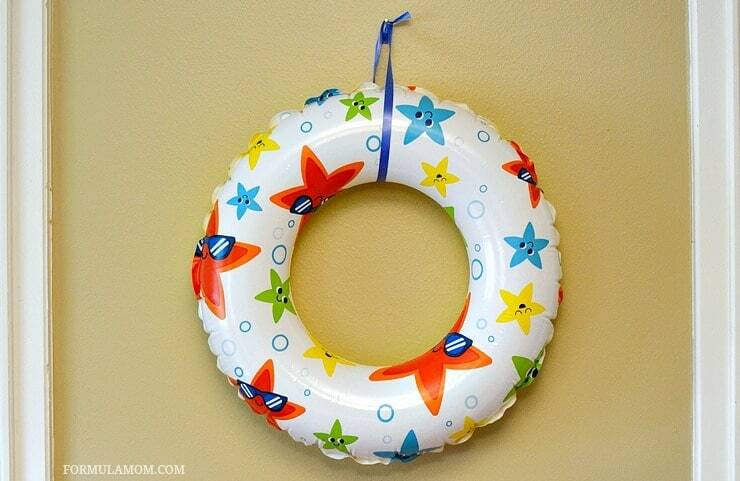 So I went into our pool bag and found the new inner tube I’d bought Weston for this summer. The colors were perfect for the bright colors I wanted to use! All I did was add a string of ribbon so I had a hanger on it and suddenly the inner tube because a wreath for our party! How easy is that? 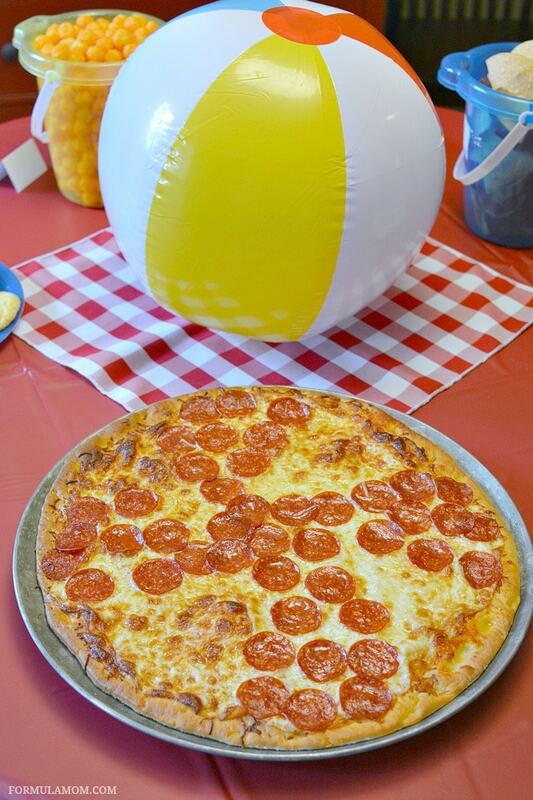 The beach ball also gave me some inspiration for our pizza toppings! I did my best to make it look like the colored sections on the beach ball! I think it turned out pretty well! Which brings me to the most important part of when we hang out with our friends — the food! Besides the pizza, we also had chips and dips. We had guacamole and a dip called Love dip from our local deli. I wanted to make spinach dip and call it seaweed dip, but didn’t get around to it. But wouldn’t it be so cute to have shark fins and seaweed dip? 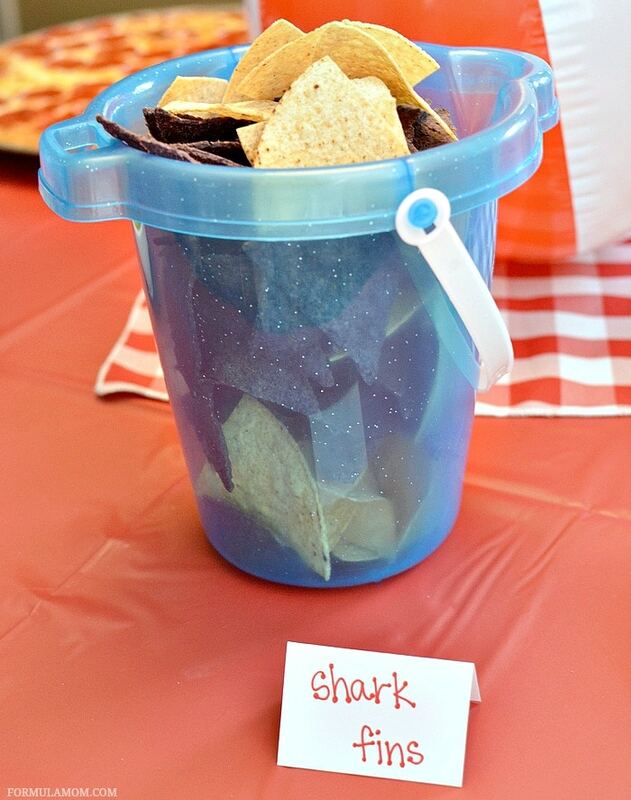 Our “shark fins” were a mix of yellow and blue corn tortilla chips for our dip. 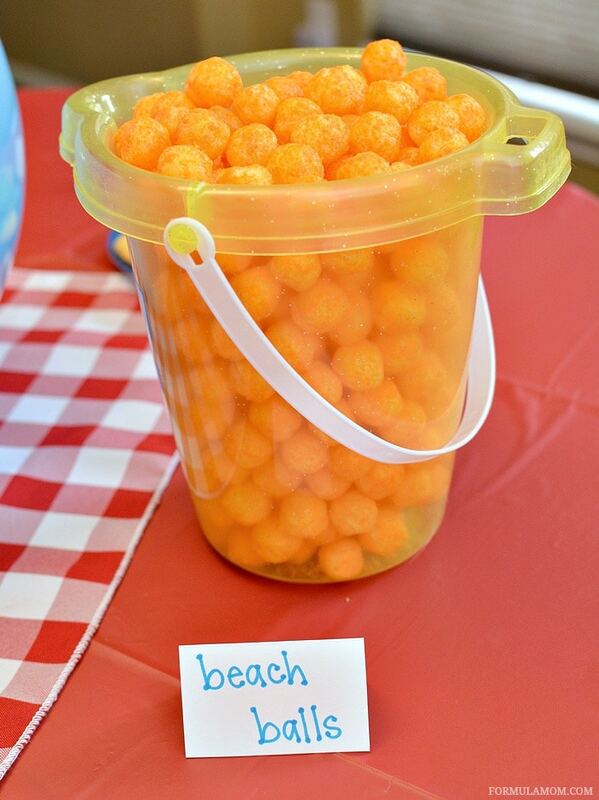 And then we had a bucket of “beach balls” which was filled with cheese balls because both the kids and adults love them! Every party needs some sweet treats so I made some easy cookies with cake mix and Jello mix. 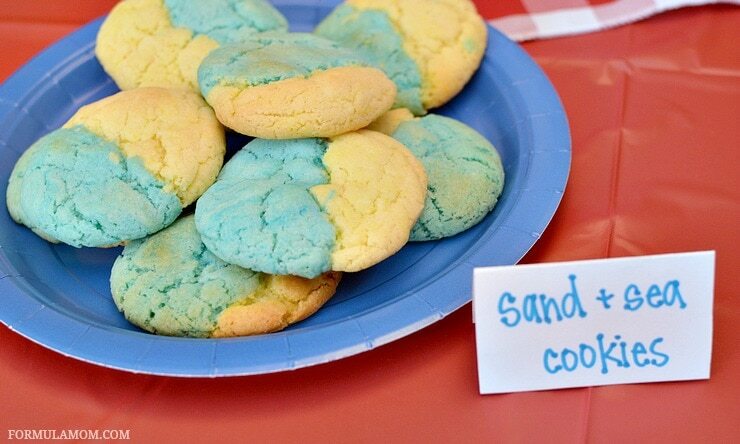 By splitting the dough into two batches I was able to make the cookies blue and yellow for our “Sand & Sea cookies” which were a huge hit! I was hoping for leftovers but I was out of luck! Since I’m a cake lover, I like to have cupcakes at almost every get-together we have! Especially if it’s a party! Cake just makes it feel like a party. 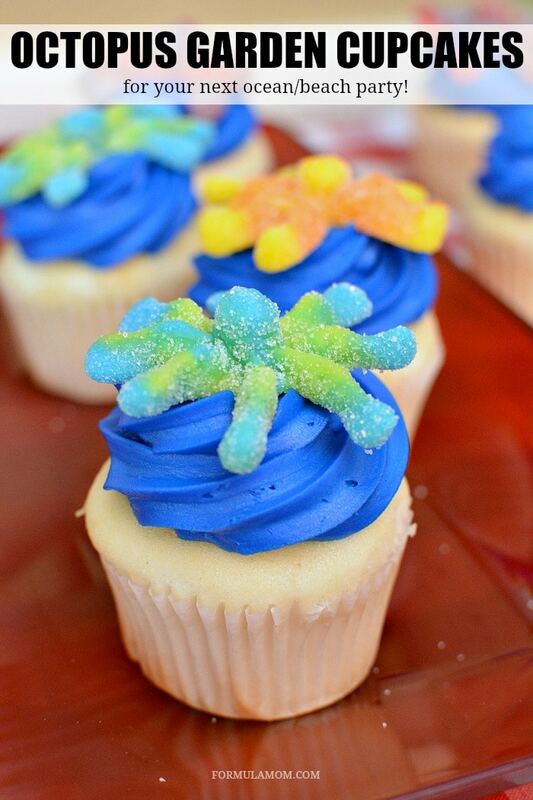 And for our beach themed bash, I wanted some cupcakes that went along with our theme. At first we were going to use smashed cookies and paper umbrellas to make beach themed cupcakes, but then Weston and I spotted gummy octopus candy when we were grocery shopping! So perfect! You can make your favorite cupcake recipe for this or depend on your local bakery. I ordered a dozen white cupcakes with blue buttercream frosting and then Weston helped me add a gummy octopus to the top of each one! In a few minutes we had a cute Octopus Garden of cupcakes for our party! Of course, no food spread is complete without drinks. So our beach party theme was wrapped with some lemonade and “Ocean Water.” Or ocean water was easy because it was just blue sports drink! 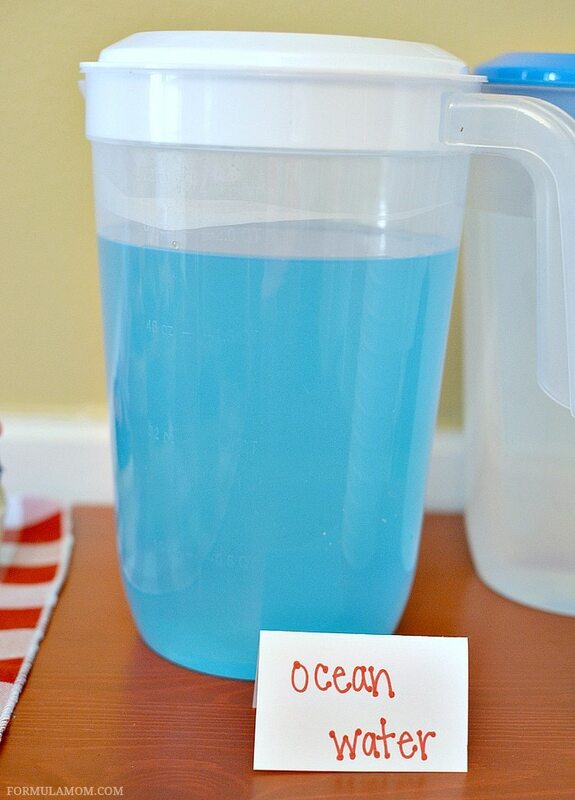 I’ve seen recipes for different ocean water drinks but this was a super simple way to get a blue drink to fit the theme. Everyone enjoyed it too! Keeping it simple is really the way to go! No stress needed for an amazing party with your friends and family! Even though we ended up stuck inside for our beach bash, I still liked knowing I was prepared for everyone to hang out in our backyard. We all spend a lot of time outside in the summer whether we’re hanging out at our house or someone else’s house. 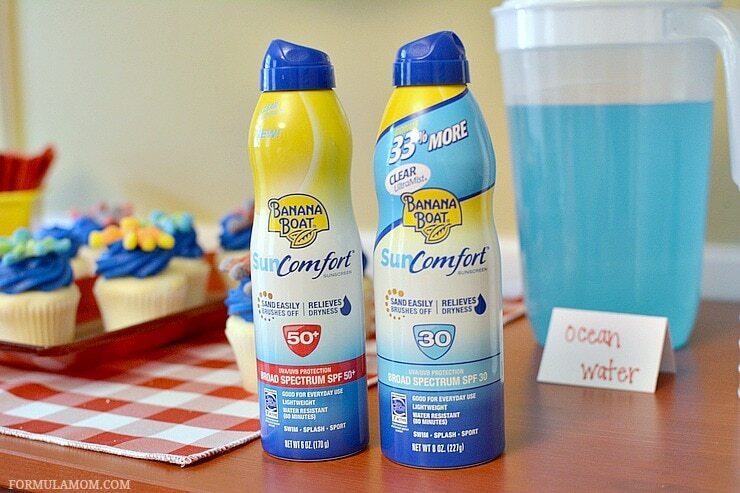 So we’ve been using Banana Boat NEW SunComfort SPFs 30 and 50+ to keep our skin protected! I’ve been applying it 15 minutes before we all head outside and reapplying every two hours or after we all work up a sweat or get wet. Summer is the time for families to reunite under the sun, at the beach, the park, or in their own backyards to enjoy those endless summer days. That’s why this summer, Banana Boat’s giving moms and families everywhere a helping hand to make sure they have the Best Summer Ever. And to top it off, one lucky family will win a Great Big Family Reunion, organized and paid for by Banana Boat. Join the party at GreatBigFamilyReunion.com.